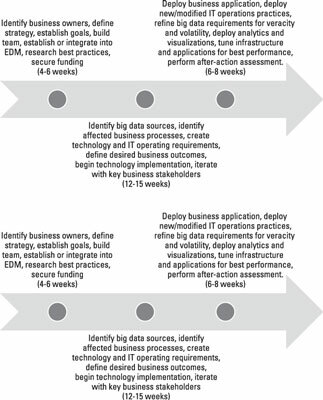 Big data implementation plans, or road maps, will be different depending on your business goals, the maturity of your data management environment, and the amount of risk your organization can absorb. So, begin your planning by taking into account all the issues that will allow you to determine an implementation road map. Many ambitious organizations always seem to need the latest and greatest technologies immediately. In some situations, an organization can demonstrate that the availability of important big data sources can lead to new strategies. In these cases, it makes sense to create a strategy and plan. 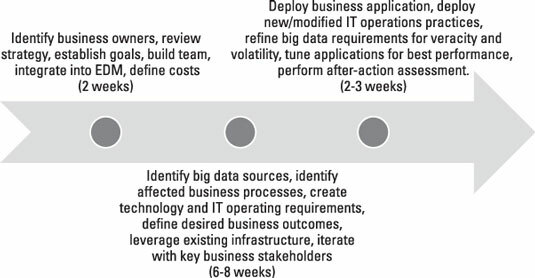 It is a mistake to assume that big data adoption and implementation are a defined project. The adoption of big data has broad implications for the company’s overall data management strategy. So, independent of some of the other factors involved, the time required to design your big data solutions should be clearly noted on any road map. In addition, the design tasks should never be glossed over or eliminated. Most companies and organizations have IT teams that follow prescribed development processes and practices. Some of these development methodologies are well suited to big data implementations, while others, sadly, are not. Big data projects are best suited for an agile and interactive development process. Iterative methodologies use short time cycles with rapid results and constant user involvement to incrementally deliver a business solution. Therefore, it is not surprising that an iterative process is the most effective development methodology for big data implementations. It is always difficult to anticipate the budgetary requirements for a new type of project like big data. The best practice is to clearly understand the expected costs and downstream benefits of your big data implementation and then secure an appropriate budget. Getting the right skill sets for any project is another challenge. Often the most sought-after individuals are stretched thin across several initiatives. So staff augmentation is often the answer, albeit not an easy one. Over time, you will find more training and more qualified professionals. In the meantime, the best practice is to identify and acquire some data science skills for design and planning, Hadoop and NoSQL skills for implementation, and parallel/cluster computing skills for operations. Every organization has a culture that will determine how much risk management it is willing to assume. If you are in a highly competitive market, you may need to take more risks on potential market innovation. However, even companies in highly competitive markets may be cautious. You have to understand the dynamics of your organization before you embark on a big data project. All organizations, even those with an appetite for high risk, must be wary as they adopt big data. The development and acculturation of any new technology or solution can be fraught with failures. Using agile methodologies to help to explicate fast successes and fast failures is the best practice for setting proper expectations in a trailblazing organization. You should think of these as starting points for how you can get the ball rolling with big data and make changes as necessary for your business. If your organization has experience with business intelligence applications and analytics, has relatively mature data management practices, and has established a high-capacity infrastructure and operations, the task of adopting big data is a bit easier. This does not imply guaranteed success or reduced risk. Get some help. Don’t be adverse to hiring an expert or two as consultants. Be sure that they know their “stuff” and ensure that they are capable of mentoring people in your organization. Get training. Take classes, buy and read books, do research on the Internet, ask questions, and attend a conference or two. Experiment. Plan to fail. Fast failure is becoming de rigueur for contemporary technology-driven organizations. The best lessons learned often come from failures. Set proper expectations. In the business world, properly set expectations can mean the difference between success and failure. Big data offers huge potential to your business only if you accurately represent the value, costs, and time to implement. Be holistic. Try to look at all the dimensions. If the project is delivered on time and on budget, but the end users weren’t trained or ready to use it, the project may fall into failure.